Presenting the first in a series of limited-edition magical items from Judika Illes, author of The Encyclopedia of 5000 Spells, The Encyclopedia of Mystics, Saints, and Sages and other books. Items are truly limited editions—-they are crafted in very small batches by Judika together with her daughter, Rachel. Once they sell out, they sell out. 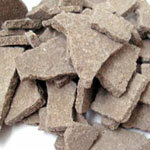 The first offering honors that saint of emergency solutions, Expedite. 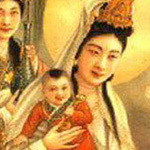 Saint Expedite is the saint of fast action and speedy solutions. If you are mired in red tape or bureaucracy of any kind; if your situation demands urgent, immediate solutions; if things are simply moving too slowly; if you are frustrated by delay and inaction; if you simply have no time to wait, then Expedite is your saint. Soldier saints like Expedite battle on your behalf. Although legend has it that– like that other great soldier saint, George– he lived and died in the 4th century, Expedite first shot to great popularity in the Middle Ages. Expedite has been performing life-saving miracles for centuries and continues to do so. His popularity has grown exponentially in recent years, indicating his responsiveness and effectiveness. 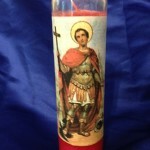 Saint Expedite has long been controversial, as he is among the preeminent magical saints. 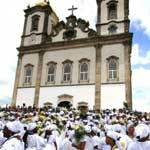 He has historically been venerated by those of all faiths and none. He is generous and does not discriminate. Saint Expedite is a tremendously powerful saint, who can perform miracles of all kinds— legal, healing, and protection, just for starters. His preferred offerings include alcoholic beverages like rum, gin, or whisky and sweet foods like pound cake and Madeira cake. He loves fresh red flowers, especially carnations. And he loves candles. . .
Expedite has a reputation of being a bit fussy about offerings— he likes things just so. 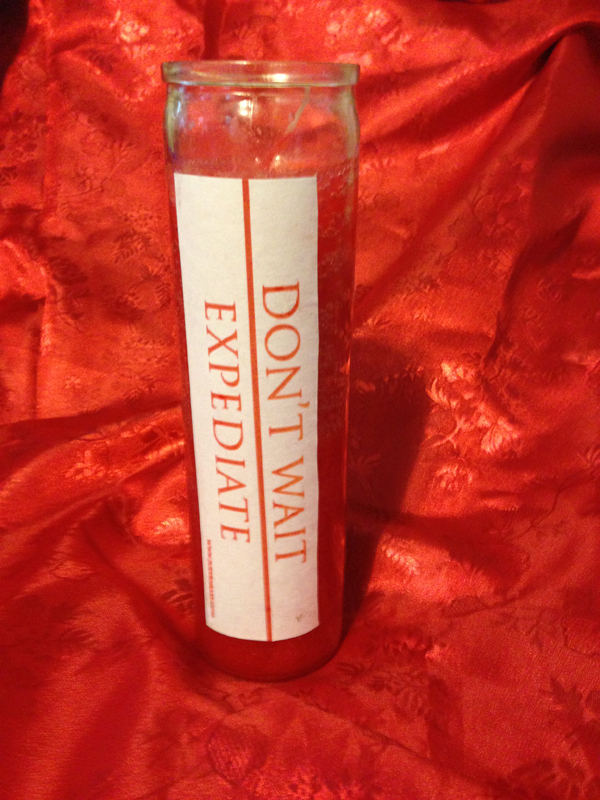 Expedite is a particularly active saint in my household. We’ve seen him reject or favor candles, especially based on image, and, so, in recent years, my daughter and I have worked to create candles that will please Expedite for our own personal use. As fulfillment of a vow, I am now offering ten of these candles for sale. 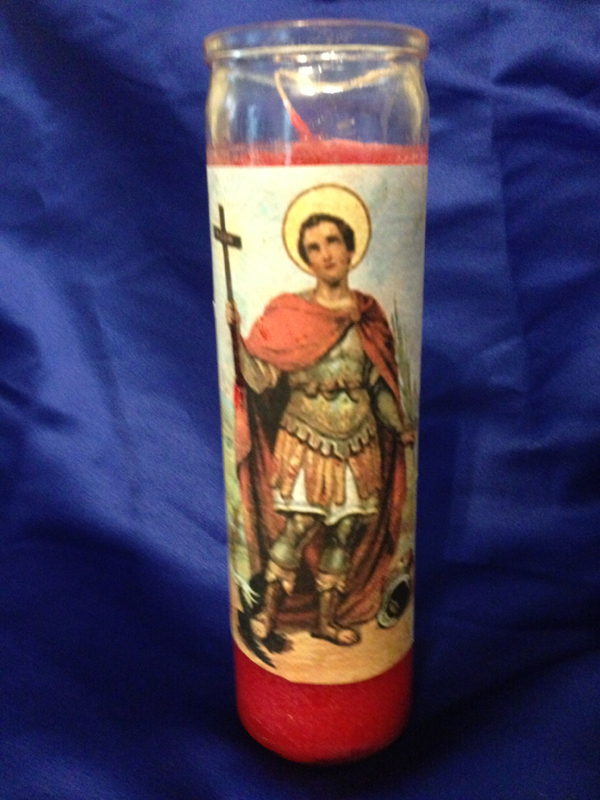 I have available for purchase a very limited number of red seven-day Saint Expedite candles, which are hand-decorated by my daughter and myself, then blessed and dedicated. I’m aware that some find the image of Expedite’s foot on the crow to be disturbing. To many modern eyes, it smacks of animal cruelty, but it’s an ancient, deliberately chosen image meant to serve as a visual pun: cras—this crow’s last word– mimics a crow’s cry, but it’s also Latin for “tomorrow” and the root of the word procrastination, something that Expedite despises. The image advertises the saint’s virtue: Expedite stamps out delays and procrastination, that eternal and ever unreachable tomorrow, in favor of solutions found NOW and today. The traditional image of Saint Expedite is also used in various African Diaspora traditions to represent other sacred beings, especially spirits of the cemetery such as Baron Samedi, Baron LaCroix, and Gede Limbo. I have deliberately not placed a name on these candles, so that it may be used to honor these sacred beings, if the purchaser prefers. • There is a limit of two candles per person. First come, first serve. • If you would like, I am happy to offer personalized assistance with purchase. Should you have questions about the petition process, offerings, or with candle-burning, there is a place on the invoice for a note—- please feel free to add private inquiries and I will respond. The candles are for Expedite and I would like to ship them SOON. Thus they are offered for sale only for a limited time, until Saturday, June 8th —– or until they sell out, whichever comes first. Don’t delay.